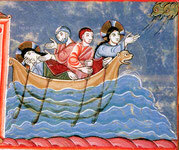 On devotions: mental journeys - protestantacademys Webseite! 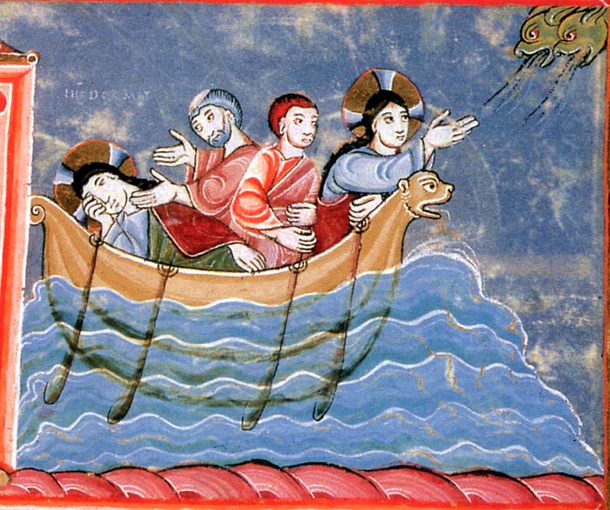 I am going to use this miniature from the Codex aureus Epternacensis depicting the “calming the storm” scene from the Gospel of Mark to show what the meaning and purpose of devotions can be. I will do this through four brief approaches: by looking at the image, by reading the passage in the Gospel, with a theological interpretation and with a few words about the Codex. To continue one line of thought from its very start to its last consequence in one go is too overwhelming a task. No one does that. Those in particular who have just had an experience or learned something new, or have a fresh idea or spontaneous feelings they want to clarify or share with others, will permit themselves to formulate spontaneously. These thoughts need not be fully fleshed out. That will happen later. What I suggest is that to deliberately just explore a notion without thinking it through right away is the meaning of the liturgic and literary form we call devotion, meditation or essay. When we say that someone is listening devoutly, we mean to say that he or she is listening attentively, is concentrated, fully focused on the subject, contemplative, deep in thought, definitely silent, still and with time. I am now expanding this meaning to encompass using one's thought to start anew once in a while, and to set out on an intellectual journey of discovery. That may leave much open and unfinished and even fragmentary. It is good to be aware of that and admit it. But no learner can skip this phase unless he or she is just looking to be trained. I am making the case for devotions along these lines because, in my experience, pictures such as the “calming the storm” scene provide a good starting point for people to talk and unfold and explore very basic notions in a way that yields clarity. This usually comes with two questions: What are you seeing? What are you thinking while looking at it? The answers will depend on the beholder's mind set. Their initial deliberations may be aided by inquiry, but no more than that. The group that has gathered for the devotions is not steered into a direction overmuch; odd ideas are to be expected, attention is given to every answer for the time being, little comment is given, nothing is pinned down yet, and alternative interpretations are welcome. We also stick to reflecting on the picture initially shown; this is not yet about developing ideas further but about making discoveries about the phenomenon at hand as if we were seeing it for the first time. This can be liberating. Every observer should allow himself or herself to start to think and to deliberate without being disturbed or corrected, and allow himself or herself the moment and the curiosity of this fresh and new encounter. But what are those with an education in art history or theology going to do while interpreting this picture? They cannot, after all, artificially ignore their knowledge. Surely not, but “knowledge” is not something cast in stone. And after all, that's what makes an art an art, that the brilliant artist in particular would be last one to claim that he fully and exhaustively knows his subject. So just contemplate the picture included at the beginning of this devotion quietly for a while. Sooner or later you will probably notice that one of the persons in the picture is pictured twice, once in the bow and once in the stern. Or, put differently: Two situations happening after one another appear simultaneously in the picture. Apparently, the artist – whose possible identity will be discussed further below – had reason to be economical and fit as much as possible into one picture. After all, perhaps we are meant to say: “The picture is a film!” We can “read” or better yet play it from left to right and thus with the clearly recognisable direction of travel against the wind from west to east. If we assume that Jesus – identifiable by his halo – sleeps on the left side and thus at the chronological beginning, in the stern where it is calmer than in the bow, then he has hurried across the deck after waking up and to the bow to raise his hand against the storm there. Having looked at the picture, I am now changing my approach. The picture is one thing, its topic another. They cannot be separated from each other, but they are different things. The topic of the picture can also be presented in a different fashion; in this case, the oldest form and “depiction” more than a thousand years older is a text in the New Testament. Behind both the picture and the text are events, contents and intentions that we can only present in the form of pictures, texts or sounds. “Devotions” are just as possible with text or sound as they are with a picture. Read the following story of the calming of the storm in the fourth chapter of the Gospel of Mark for yourself. 35 That day when evening came, he said to his disciples: Let us go over to the other side of the lake. 36 Leaving the crowd behind, they took him along, just as he was, in the boat. There were also other boats with him. 37 A furious squall came up, and the waves broke over the boat, so that it was nearly swamped. 38 Jesus was in the stern, sleeping on a cushion. The disciples woke him and said to him: Master, don’t you care if we drown? 39 He got up, rebuked the wind and said to the waves: Quiet! Be still! Then the wind died down and it was completely calm. 40 He said to his disciples: Why are you so afraid? Where is your faith? 41 They were terrified and asked each other: Who is this? Even the wind and the waves obey him! The first four verses should suffice as food for thought. Remain just briefly with the first two verses 35 and 36. Obviously, something has happened before, which one could consider, but that would be a distraction. Let it rest for now. You can get back to that later. The actual dramatics of the scene start with verse 37. This is where you stop to observe. Imagine you didn't know how to proceed now. A storm is coming, an average is unfolding, a chain of catastrophic events is setting in, the situation coming to a head, the boat is about think anytime now. How would you react? With panic? In shock? Use your imagination. What catastrophes have you experienced? How did you feel? Of all things, for someone to calmly sleep on his pillow seems unthinkable, right? Would that be an option for you? What do you think about that? Isn't it a bit comical? Does the sleeping Jesus give the impression of ironic or even cynical superiority? Isn't it rather outrageous? How naive, how fatalistic, how self-absorbed and ignorant is that? I interpret this as the crew members being outraged: “Don't you care at all?” Do you interpret this the same way? Don't you read the question in the second part of verse 38 as an accusation? We are at the centre! Did you notice what they called him? Master! The spirits are raging, but the master is sleeping – very confident! Why master? Who is he that they call him master? What are the disciples expecting of him? What do you think do they expect as they find the master asleep, wake him and ask him the accusatory question: “Don't you care that we are going to die?” What is he supposed to do after all? What could he do? Use your imagination once more. Scoop water out of the boat? Throw ballast over board? Man the oars? Pray like the sailors in that other sea travel story of Jona? If someone is a “master” then the suffering of his creatures should not leave him cold. He should at least “care”. The master replies with a counteraccusation: “Why are you so afraid? Where is your faith?” And he doesn't stop there. He speaks once again, this time not to the crew but to the storm, and in such a way that the disciples can hear and witness it. The scene ends with them in turn talking to each other about the master. They are wondering who he really is. After all, they are amazed that the elements obey him. In another passage, the master tells them to not to blare out what happened but to keep it to themselves. I'll stop here and state the following thesis for myself: The human brain, and every organism, even the most primitive one, is the physical manifestation of the expectation of meaning. The quest for self-preservation is based on the notion to be in whatever sense important. Everyone will attempt to fight for his or her life in such a situation, whatever happens. The band on the Titanic reportedly played until the ship had sunk. What exactly is the master doing here? Jesus doesn't bother with treating the symptoms, instead he turns all his attention and strength to the root of the problem and very successfully so. And a miracle happens. The travellers in the boat are not travelling for a nondescript purpose, but are on a very specific mission. The master has convinced the disciples to follow him and they form a teaching and learning community; in this scene, this community is facing an immediate threat and impending failure. This lends great significance to the miracle: If Jesus wasn't master of the elements, if his mission hadn't weathered and survived many storms, then his story would not have made it to us. So there is reason to hope that it will continue. The evangelist and his audience were contemporaries of the Roman-Jewish War. This very bloody suppression of the Jewish insurrection by Rome from 66 to 74 AD, is called Bellum Judaicum in Latin. The war involved several massacres and ended with the destruction of the Temple of Jerusalem; the city remained uninhabitable for 60 years. Is the evangelist trying to console his community in a time of political storms by reminding them of the cosmic superiority of the master? Could it be helpful to relativise the concept of miracles? Isn't it a miracle that anything exists instead of nothing? On second thought, aren't even the most basic things we take for granted anything but self-evident? Isn't every moment a miracle? What, then, holds the world together? Are we not allowed to ask that? This story, however, tells of a non-mundane miracle; the Gospel even ends with the miracle of the resurrection of Jesus! This, however, overstretches the usual function of religion to divide reality into the mundane and the sacred, to leave the former to the acts and ways of everyday life, and deprive that life of the latter. The reality of the world as a whole is now declared mundane and only God is holy. What are we referring to when we no longer talk about God but of God and even with God? Isn't that even more daring than talking to a storm? The text says that it became “completely calm”? What is happening there exactly? The disciples calm down, start to think and talk to each other. Who is he who controls the elements of the cosmos with ease and still sits in the same boat with them? This very scene describes how the myth is compelling the disciples towards the word. The man makes them think. They want to understand what they have seen. People cannot think without organising their chains of thought into a coherent form. Therefore, when we inquire and research about the beginning, structure, essence and principles and the aim and end of our universe, we end up with infinite questions. Someone who really starts to have experiences and to think systematically will find on the one hand not able to stop himself from researching, but on the other hand will never be able to finish his research. Should he just stop at some arbitrary point? Or should he just stop expecting coherence and meaning because this expectation will never be fulfilled? If he did, he would stop thinking. But how can we both have our mind embark on a risky journey of potentially infinite experiences and at the same time stabilise it? How can we expose ourselves to the stream of time with all its turbulence, contradictions and abysses while still thinking in a steady, calm and consistent way? Is it not the case that we can only do that if we leave “reason” and “mind” be carelessly undetermined as an overarching idea and infinite task and leave “God” as creative love that fills and sustains everything, and spare them our zealous urge to determine and ascertain? I am now going to try out a fourth approach. I will assemble a few pieces of information about the book that contains the picture and the Latin version of the text. It predates us by more than a millenium. The above picture is a miniature from the Codex aureus Epternacensis (Folio 54 recto), also called Codex Gothanus, or “Gospel Book of Echternach”, although a number of other manuscripts from the same cloister are called that. This work of Ottonian illumination was created in the Benedictine Abbey of Echternach between 1030 and 1050, during the term of office of Abbot Humbert von Echternach (1028–1051). The volume consists of 136 vellum pages with a size of 445 x 310 mm and contains all four Gospels in Latin language. The manuscript is very lavishly illuminated, containing over 60 decorative and ornamental folios, each written on in golden minuscules, including 16 full-page miniatures – one of them is the one we are looking at – four evangelist portraits, ten canon tables, nine full-page and 16 half-page initials and 503 smaller initials. That was my small devotion. You could also call it an essay. Did reading it have a liberating effect? Have you found yourself? Did it expand your horizon? That would make me glad. What is important enough for you to take the time to contemplate for a while? The gods are asleep, reason is asleep. What reactions do such motifs elicit in you? Do you think it's okay that our society has institutions that do nothing but maintain archives? The Lord's Prayer ends with the word “For Yours is the kingdom, the power and the glory forevermore. Amen.” What function could a religion have whose most important prayer reserves such pathos formulae for God, and whose miracle stories reserve for instance the role of “weather god” for the “Son of Man”, Jesus? The suppression of two more insurrections – the rebellion of the diaspora around 116 AD and the Bar Kokhba revolt from 132 to 135 AD – resulted in the definite demise of the last remnant of Jewish statehood. Like Christianity, Judaism had now become a “religion”. Cf. Walther, Ingo F. / Wolf, Norbert (2005): Meisterwerke der Buchmalerei. Die schönsten illuminierten Handschriften der Welt, Cologne, 128-131.